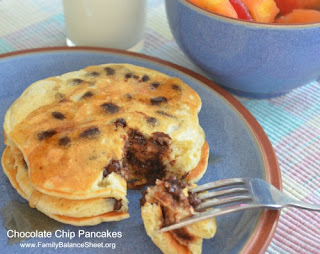 My oldest daughter requested Chocolate Chip pancakes recently for breakfast and who am I to deny my sweet daughter chocolate chips for breakfast. Of course, I let her know that it was a special treat and won’t happen often. Honestly, it was a moment of weakness for mommy and I probably ate more than any other person in my family. Have I told you recently how much I love pancakes? And when you add chocolate…oh my! Adapted from America’s Test Kitchen. ** Don’t have buttermilk? For this recipe, combine 2 tablespoons white vinegar with enough milk to get to 2 cups. Sit for 5 minutes. 1. Combine the dry ingredients: flour, sugar, baking powder, baking soda, and salt . Set aside. 2. In a separate bowl, mix together the wet ingredients: buttermilk or substitute, melted butter, egg, and vanilla. 3. Add the flour mixture to the wet ingredients. Mix together until just combined. Batter might be lumpy. 4. Heat a non-stick griddle on low. Pour the batter onto the griddle in ¼ cup measurements. 5. Sprinkle chocolate chips onto each pancake. 6. When the batter starts to bubble and the underside is golden brown, flip the pancakes and cook the other side until cooked through. Note: I’ve learned that it’s better to sprinkle the chips onto the pancakes on the griddle. I originally added the ½ cup of chips to the batter, but I ended up with some pancakes with A LOT of chips and some pancakes with hardly any. It wasn’t consistent. Print recipe for Chocolate Chip Pancakes.